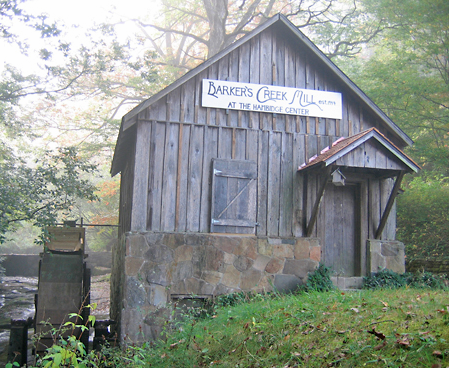 Barker’s Creek Mill is still operated by Hambidge on the First Saturday of each month from 1p.m. to 4 p.m., and by appointment to provide milling services to area farmers. Our volunteer miller is happy to answer any questions. Barker’s Creek Mill has been providing the local community with milling services since the mid 1800’s. Mary Hambidge built the current mill in 1944 at the site of an older mill that served the community since the first white settlers came into the area in the late 1820’s. The mill is powered by a 12-foot overshot wheel set on babbet bearings. It was converted from a wooden spoked, steel-rimmed wheel to the current metal spokes in the 1960’s. The mill has been renovated three times in its life, the most recent in the late 1980’s. The mill itself is a vertical mill with two 16″ flint/granite stones. It was built by the Meadow’s Milling Company in North Wilkesboro, North Carolina.